The Snack & Save Canada portal has added a new printable coupon that is valid from the 21st to the 27th of February. 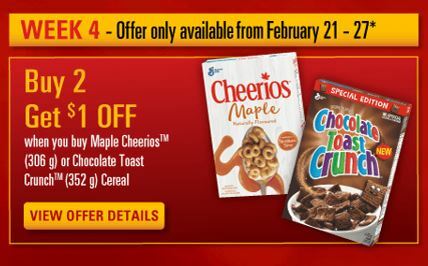 Save $1 when you buy two Maple Cheerios 306g, or Chocolate Toast Crunch 352g cereal. As with the previous coupon available through the portal, this offer is valid at Loblaws banner stores including Loblaws, Atlantic Superstore, Provigo, Zehrs, Valu-Mart, Independent, and Fortinos. It is not valid at Real Canadian Superstore unfortunately. I don’t see this cereal advertised on sale in any of my flyers for this week, but check the price at your local stores because there could always be in store sales, or bonus PC Optimum points. Click here to print your coupon for $1 off the purchase of two boxes of Maple Cheerios or Chocolate Toast Crunch Cereal through the Snack & Save Canada coupon portal.